For 10 years XEGA is involved in the Asturian Public Institutes with a workshop on gender diversity and sexual orientation in order to prevent bullying. Prejudices and stereotypes prevent young lesbian, gay, bisexual and transgender (LGBT) become visible as such because the usual responses are verbal and/or physical aggressions, humiliations even leading to death. The aim of the workshops is to break these prejudices and stereotypes. Transmit information about LGBT reality and move towards normalization. 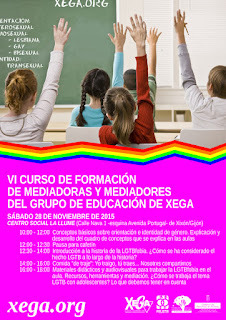 12:30 - 14:00 Introduction to the history of the LGBT-phobia. How it has considered the fact LGBT throughout history? La Llume Social Center, at Nava Street 1 (corner Portugal Avenue) of Xixón/Gijón. The course is free and no prior registration is required. Attendance certificate will be issued.